House Speaker John A. Boehner will nominate the Rev. Patrick J. Conroy, a Jesuit priest and former Georgetown University chaplain, to become the 60th House chaplain. Father Conroy, 60, was selected in consultation with Representative Nancy Pelosi, the Democratic leader. His nomination will be submitted to the House this month for a confirmation vote. If he is confirmed, Father Conroy will become the chamber’s first Jesuit chaplain and third non-Protestant chaplain, although guest chaplains have been from other faiths such as Islam and Judaism. He will replace the Rev. Daniel P. Coughlin, who retired in April after 11 years in office. Fr. Conroy, an Oregon Province Jesuit, has been since 2004 a theology teacher and campus minister at Jesuit High School in Beaverton, Oregon. Here's the story from Oregon. You can find out more about Conroy here and here; more about the House chaplain's role here. 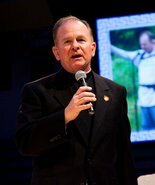 You can listen to an interview with Father Dan Coughlin about his time as House chaplain here. Did I imagine it or is this the second posting by David Smith? The first had a bite at the end. I think it is always better when a priest has had some experience of life before his vocation comes. Years ago,well about 8 I was in a police station in Novara in the North of Italy registering there.In came a Legionnaire of Christ(unmistakeable! )with a group of about 10 young guys who looked Mexican and about 15 each.I am sure none of them was shaving.At the time I was more devout than Mother Teresa but looking at them I knew something was wrong. I can only imagine how it turned out for them .